It is that time of year again – both for those delicious fresh strawberries and time to express your patriotism by celebrating all things red, white and blue for 4th of July and Memorial Day. 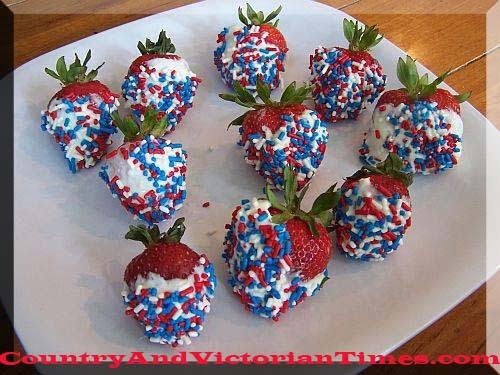 Here is a simple way to dress your strawberries up and it will make your next get together more festive. Simple dip strawberries into melted white chocolate or melting chocolate and dip end in a mix of red and blue sprinkles. They even have sprinkle with little stars that come as blue and red. This entry was posted in Crafts ~ DIY ~ Projects, Recipes, ~Dessert, ~Edible, ~Fourth Of July, ~Holiday, ~Memorial Day, ~Party, ~Snack and tagged chocolate, cold, cook, Fourth of July, holidays, Independence Day (United States), july, memorial day, sprinkle, sprinkles, strawberries, strawberry, ~Food, ~Home, ~Party. Bookmark the permalink.